Supertest Information – Was kommt nach 9.20? Im Wargaming WoT-Forum sind Informationen, zu dem was nach 9.20 kommen kann erschienen. Ich zitiere einige Dinge und verlinke euch natürlich die Quelle. This time we plan to test changes to vehicles in the alternative branch of British TDs: to the Supertest go the vehicles of Tiers VII, IX and X – Challenger, Conway and FV4005 Stage II. The vehicles will be updated in order to make them more competitive: they’ll get increased firepower and survivability due to improved mobility and better flexibility due to improved gun depression. Challenger will receive a new gun with higher alpha-damage, which should change its gameplay to be in line with other British TD’s – being able to fire from positions with less maneuvering needed. Conway will also get a new gun and more flexibility for causing damage due to an increase of gun depression to -10 degrees and an increase of the turret rotation angles. In addition, the speed will be increased. 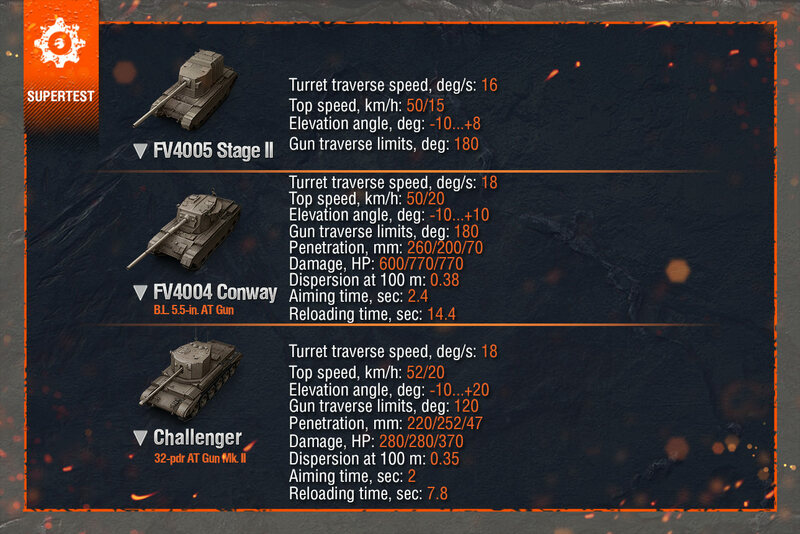 FV4005 Stage II – the updates of the vehicle are similar to the previous vehicles: an increase of turret rotation angles and gun elevation angles, as well as increased mobility. The updates are intended make the FV4005 more competitive on the battlefield. Please note that this is the first stage of testing these updated TDs, final characteristics might differ from the ones mentioned above. We’ll keep you updated with the changes that are being tested on Supertest – stay tuned!